Yes, folks, that is a Union Jack flying over sovereign American territory under the permission of the U.S. government. The flag and flagpole were provided by Her Majesty’s Government as a sign of friendship. 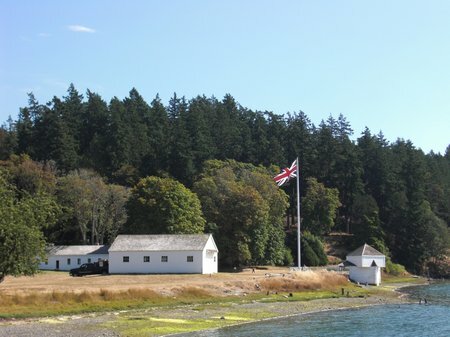 This flag of the United Kingdom of Great Britain and Northern Ireland flies over English Camp on the San Juan Islands. (You’ll excuse me for using the full title of the U.K. – being an Irish expat I’ve had to explain the political subtleties of the British Isles more times than I’d care to count. I find it’s helpful to be explicit). English Camp, on the north-westerly side of San Juan Island is half of the San Juan Island National Historic Park, the other half being American Camp which lies on a south-easterly promontory. These sites were where the English and American garrisons respectively encamped during the negotiations over sovereignty of the Islands. This historical blip is known as the Pig War (1859 – 1872) since the matter of which flag really should fly over the San Juans was brought to a head when an American settler killed a trespassing pig owned by the Hudson Bay Company in June 1859. Where else does the Union Jack fly in the USA? When we visited English Camp over Labor Day weekend we chatted to one of the friendly rangers about the history of the place. During the conversation, he mentioned that English Camp is one of two places in the U.S. where the National Park Service flies the Union Jack on it’s own. Do you know the name of the other park? Leave your guess in the comments below. This entry was posted in Kid Travel Photos and tagged English Camp, Pig War, San Juan Island, Travel Photos, Washington on October 1, 2009 by wandermom. It’s Seafair weekend in Seattle! Actually, Seafair runs all summer long with neighborhood festivals and fun family and sporting events. 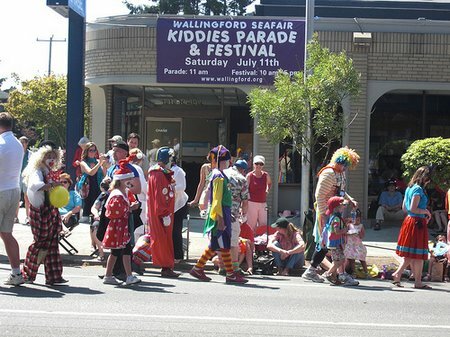 The photo above was taken at the Seafair event in my neighborhood which is a Kiddie Parade and street fair. It’s a blast! Have a great Photo Friday. This entry was posted in Exploring North America and tagged Seafair Clowns, Seattle, Travel Photos, Washington on July 31, 2009 by wandermom. Like they need to be traveling to make them say funny things. 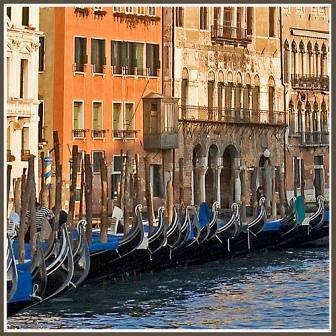 Traveling just adds an extra fuel to the imaginative and verbal mix-ups they come out with. 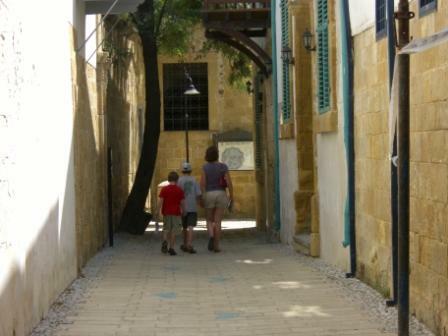 Kayt Sukel wrote a fun piece on why we travel with kids last week. It made me think of the whacky things my boys have said and done during our many adventures. I laughed out loud as I remembered. Here’s a selection of some of my favorites. As you’ve probably noticed from my recent posts, we spent some time in Italy this summer. The WanderDad and I try to help our kids observe local cultures and customs when we travel. 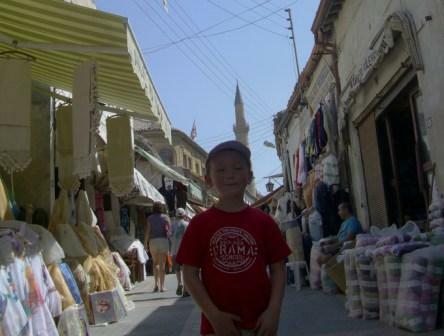 Mostly, since they’re kids, that starts with learning how to say “hello”, “good-bye”, “please” and “thank-you” in the local language and insisting that they do so while we’re on the road. I’ve never even considered whether or not my children thought this was an imposition. So I was surprised when BigB pronounced that he was “so glad he didn’t have to keep speaking Italian” to the front desk attendant in a very heartfelt way when we checked into our hotel in London on our way home this year. 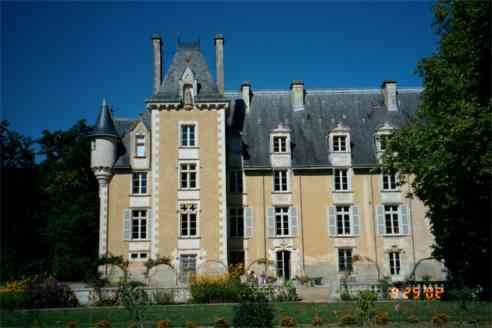 In 2005 we played in castles (in Ireland), attended a wedding at a pretty fancy castle (again in Ireland), stayed in a castle (in Poitiers, France) and visited more castles (in the Loire Valley). My travel-worn five-year-old protested. “Hand’s up who’s all done with chateaus” he demanded at the top of his voice. We bailed on visiting any more castles and just hung out instead. But my favorite of all the strange kid sayings has to be BigB’s reaction when he saw the Parthenon. It was hot and we had been walking around Athens for most of the day. The Plaka, the neighborhood around the Acropolis, is a fun place to explore, but you do have to walk uphill to get to the Acropolis itself. With much grumbling and moaning my children trudged up the hill. As we came through the gates, and the Parthenon came into view, they were obviously impressed. But not in the way I thought. 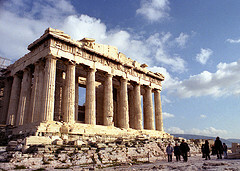 “That looks just like Age of Empires.” BigB exclaimed as he looked up at the Parthenon. What can I say? This entry was posted in International Escapades and tagged Funny Kid Comments, Travel Photos, Traveling With Kids on September 17, 2008 by wandermom.